The recipe for these Sweet Potato Pancakes was originally posted on Recipe Girl. I don’t skimp on breakfast. It’s my favorite meal of the day. It is the one meal where it’s appropriate to eat something sweet like peanut butter cake doughnuts or apple cinnamon rolls. Yes, those are some sugar laden recipes. 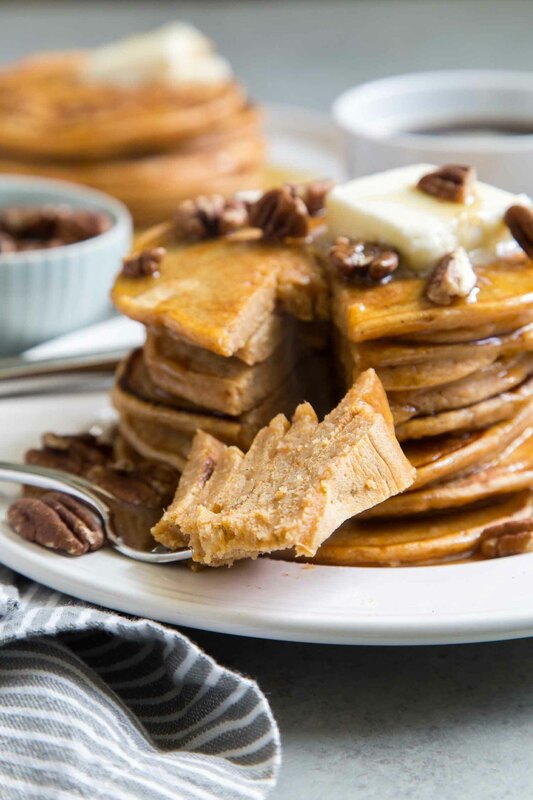 Here’s a sweet breakfast dish that’s a tad bit more healthy: sweet potato pancakes! What’s the quickest way to cook sweet potatoes? Forget roasting. That takes upwards to an hour of baking time. Instead, use the microwave! Wash and scrub the sweet potatoes clean. Pat dry and pierce all over with a fork. Place the docked sweet potatoes on a microwave safe plate. Microwave at two minute intervals until the sweet potatoes are soft. That’s it! The entire cooking process will take about six to eight minutes. During the two minute intervals, flip and rotate the sweet potatoes as needed to ensure even cooking. You decide. Eight minutes using the microwave or 45 minutes in the oven? I prefer the microwave method! The sweet potatoes can be cooked ahead of time, up to three days. Simply keep the cooked potatoes chilled in the fridge. Scoop out the sweet potato filling or keep them in their skin. Nothing beats a stack of fluffy pancakes on a weekend morning. 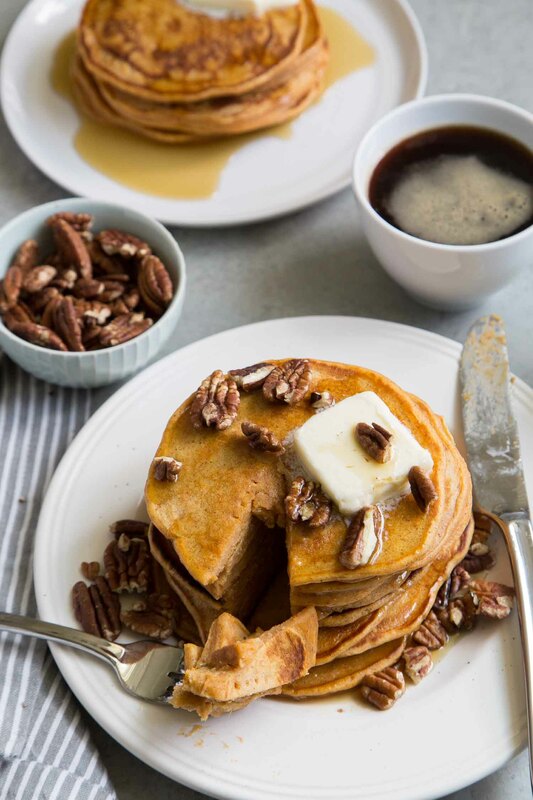 As the weather cools down, I prefer sweet potato pancakes over the traditional buttermilk pancakes. 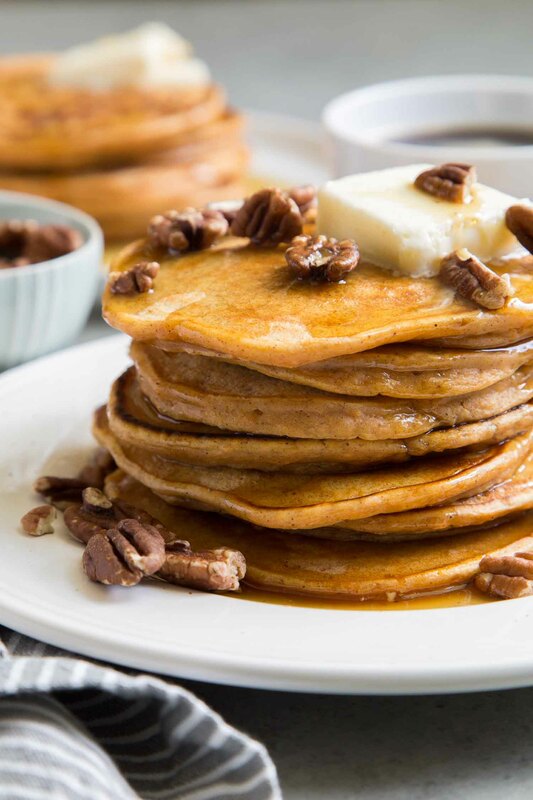 These sweet potato pancakes are spiced with cinnamon and nutmeg. However, if you’re into pumpkin spice, you could totally swap that in place. Or better yet, make a stack of these babies and enjoy it with a PSL on the side! Remove sweet potato skin and mash until smooth. Allow to cool. Combine milk, eggs, vanilla, and melted butter until smooth. Add in mashed sweet potato and stir until incorporated. In a large bowl, whisk together flour, sugar, baking powder, salt, nutmeg, and cinnamon. Add wet ingredients to dry ingredients. Use a spatula to fold mixture together. Mix until there are no longer any dry streaks of flour. Do not worry if mixture is not completely smooth. Set skillet or griddle to medium heat. Lightly grease with butter or oil. Once warm, pour in 1/3 cup portion of pancake batter. Cook until bubbles begin to form on surface and edges of pancake are set. Flip pancake and cook the other side until lightly browned. Repeat with remaining batter. Adjust heat accordingly if pancakes are browning too fast. 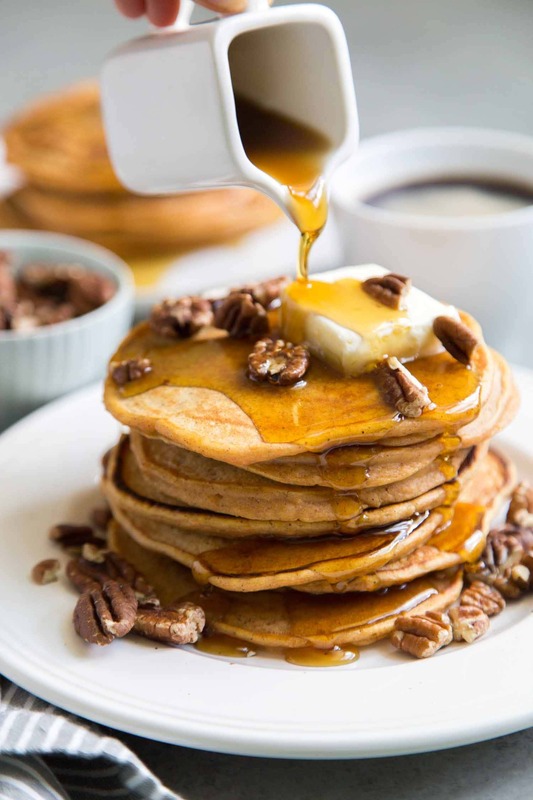 Immediately serve sweet potato pancakes warm with maple syrup, salted butter, and toasted pecans. 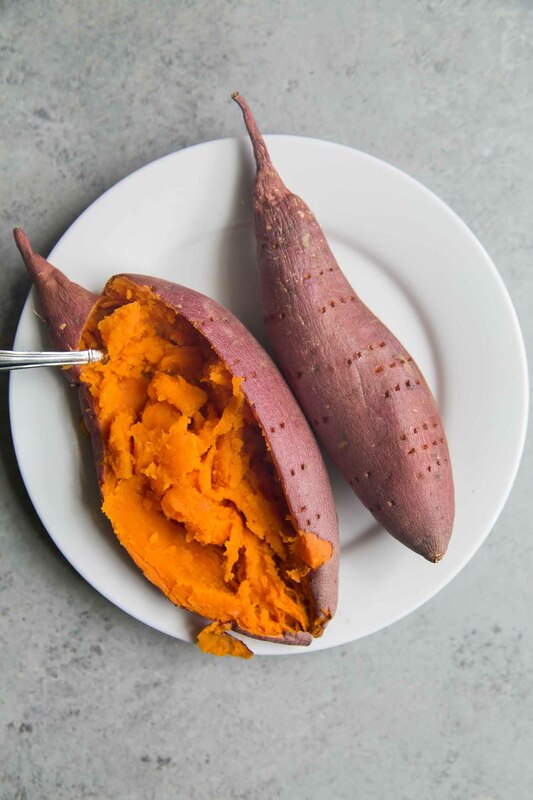 The two small sweet potatoes photographed above yield roughly one cup of mashed sweet potato. Alternatively, you can roast the sweet potatoes in an 400 degrees F oven for 50 to 60 minutes until soft. Mashed sweet potato can be prepared ahead of time and stored in the fridge for up to 3 days. These looks super yummy and perfect for the fall! What flour can be swapped for gluten free? And ratio? I’m sorry. I’m not well versed in gluten-free flours.